PODGORICA, Montenegro (AP) — Incumbent Filip Vujanovic has won Montenegro's presidential election, despite opposition claims that their candidate was the winner, election authorities said Monday. Opposition members have said they will not recognize Vujanovic's victory in Sunday's ballot, even if confirmed by the official election commission. If the opposition does that, it could throw this small Balkan nation into political turmoil and hinder its efforts of joining the EU. Opposition official Goran Danilovic insisted that the opposition candidate, Miodrag Lekic, won the vote for the influential but ceremonial position. Danilovic told The Associated Press that "our victory is as clear as a day." He said, "None of us have the right to recognize election fraud." But the election commission said Vujanovic won 51.21 percent of the votes, compared to 48.29 percent for Lekic. Drazen Medojevic, an opposition representative in the election commission, said Lekic's camp "has disputed in full the election results and filed a request for a recount in all Montenegrin municipalities." "We cannot accept the results until we determine all the irregularities," Medojevic said. They include alleged irregularities with invalid ballots and voting by mail, he said. Vujanovic, who is backed by the government, is seeking his second presidential term since Montenegro gained independence in 2006. The 59-year-old law expert is a close ally of Montenegro's powerful prime minister, Milo Djukanovic, and a strong advocate of Montenegro's accession into the European Union and NATO. Montenegro, a nation of more than 600,000 people, is striving to join the European Union and opened entry talks last year. Any political instability in the country could slow the legislative and other reforms often required as a condition for membership in the regional bloc. The tight election results also are a blow to the long-serving governing coalition led by the left-leaning Democratic Party of Socialists, which has been in power for more than two decades. 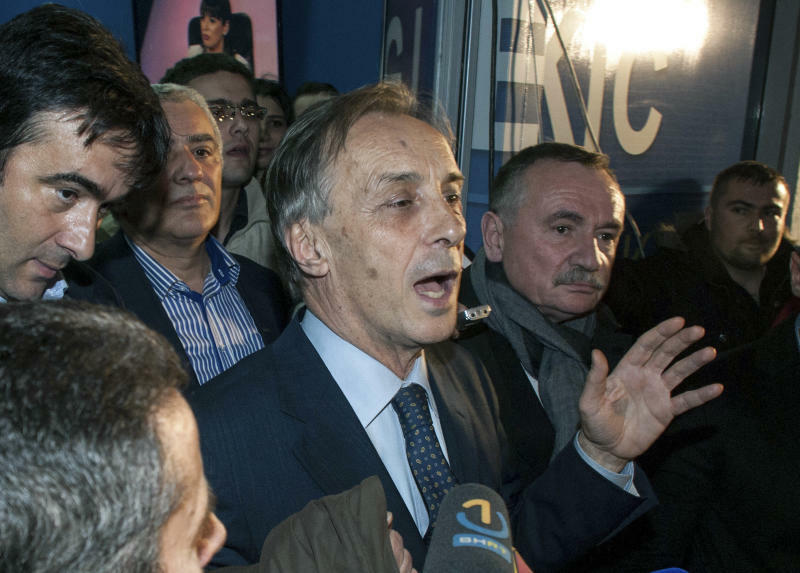 Lekic's strong election result amounted to the first serious challenge to the ruling party's grip on power. Lekic, a former diplomat, has had the support of the country's otherwise divided opposition parties. He has accused the government of widespread corruption and crime and demanded that NATO apologize for the bombing in 1999 of Montenegro, which was part of the Serb-led Yugoslavia at the time. Political analyst Drasko Djuranovic predicted that "we are probably entering a period of tension and crisis during which the opposition will deny the legitimacy of the president and the ruling coalition." Opposition official Danilovic alleged irregularities in the final hours of voting on Sunday. He said that "we will demand full insight into the election material and full vote count." International monitors who observed the vote refused Monday to comment on the opposition claims. The monitors from the Organization for Security and Cooperation in Europe said that "from a technical standpoint the election was administered in an efficient manner and fundamental rights were mostly respected." "At the same time, allegations of irregularities and an atmosphere of mistrust in the lead up to the vote had a negative effect," said Boris Frlec, the mission head. Jovana Gec contributed from Serbia.